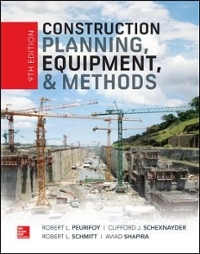 ramaponews students can sell Construction Planning, Equipment, and Methods, Ninth Edition (ISBN# 1260108805) written by Robert L. Peurifoy, Robert Peurifoy, Clifford Schexnayder, Clifford J. Schexnayder, Robert Schmitt, Aviad Shapira and receive a $61.86 check, along with a free pre-paid shipping label. Once you have sent in Construction Planning, Equipment, and Methods, Ninth Edition (ISBN# 1260108805), your Ramapo College textbook will be processed and your $61.86 check will be sent out to you within a matter days. You can also sell other ramaponews textbooks, published by McGraw-Hill Education and written by Robert L. Peurifoy, Robert Peurifoy, Clifford Schexnayder, Clifford J. Schexnayder, Robert Schmitt, Aviad Shapira and receive checks.